Channel9 website published new Lync 2013 sessions, this time from Ignite sessions. October 10th 2013 was a session about Exchange 2013 architecture. Now you can watch this session in internet. This session introduces you to the new Exchange Server 2013 architecture, which delivers numerous enhancements to deliver service-class performance and scalability from many lessons learned from Office 365. Come learn about the new Client Access Server and Mailbox roles as we dive into client access, transport, managed store, service availability, modern public folders, and more! You can watch them or download. Sessions were presented by Jason Helmick and Mike Pfeiffer. Tomorrow you can take a part of Ignite Webcast – Exchagne Virtualization. On exchangevirtualconference.com website you will find video sessions about Microsoft Exchange 2013. The Exchange Virtual Conference is a free, online event featuring presentations by Exchange Server MVPs, and they did great job for us. Sessions are available on-demand so you can watch them online (Flash is required) or you can download them. What’s New in Exchange 2013: The Good, the Bad, and the Ugly – J. Peter Bruzzese – In this session we will take a quick down memory lane as we review these enhancements and bring us right up to our day with Exchange 2013. We will focus on major new features like the new Exchange Admin Center, modern Public Folders and more and walk through the interface to ensure you have a clear picture of the scope of Exchange 2013 before you dive deeper with the sessions to follow. Load Balancing Exchange Server 2010 and 2013 – Johan Veldhuis - n this session we will have a look at how we can load balance our Exchange 2010 and Exchange 2013 environment. First we look at the some load balancing essentials where I will discuss which terms are important. Once we completed this part we will have a look at how to configure your load balancer for Exchange 2010: which configuration options are available, which things must be configured on the Exchange side and followed by a demo where I will let you see how to do it. As final part of the presentation we will look at Exchange 2013: what are the differences, which things are important to keep in mind and a demo where I will let you see how to do the load balancer configuration. Exchange Server 2013 Site Mailboxes – Serkan Varoglu - This session presents an overview of Site Mailboxes, a new feature in Exchange Server 2013, as well as a demonstration of the setup and functionality of Site Mailboxes. Upgrading to Exchange Server 2013 - Jaap Wesselius – This session presents an overview of the migration paths for upgrading from Exchange 2007 and 2010 to Exchange Server 2013. Identity and Access Management in Office 365 – Michael Van Horenbeeck – This session covers identity integration solutions for Office 365 hybrid deployments, including a demonstration of setting up ADFS for a hybrid deployment. Exchange Server Tips from the Trenches – Paul Cunningham - This session walks through some real world, hands on tips for managing Exchange Server environments. 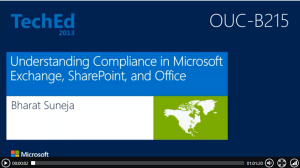 Below you can find links to online sessions from TechEd 2013 North America. All sessions are about Microsoft Lync Server 2013. Abi Maggu – This session examines the use of Microsoft Lync Online in a hybrid environment for user access, now possible with the release of Lync 2013 to Microsoft Office 365. For existing deployments, using Lync infrastructure already deployed, customers can easily expand their environment into Office 365. New deployments can also benefit by decreasing the on-premises Lync footprint and hosting users online. Benefits of using Lync Online in a hybrid configuration include being able to leverage global infrastructure to provide ease of access, a reduced on-premises server footprint, being able to consume cloud services at your pace, additional capacity on demand, and hosting users in highly available and secured datacenters. Lync Online through hybrid provides both a model for easy expansion and a model for cloud services at your own terms. Just finished TechEd North America 2013, and already you can see through Channel9 sessions that took place there. Organizations are increasingly in need of solutions that help them to meet compliance requirements and protect information. Come learn about our overall Office-wide investments in Compliance in Exchange, SharePoint, Lync, Excel, etc. In this session, learn about managed availability. With managed availability, internal monitoring and recovery-oriented features are tightly integrated to help prevent failures, proactively restore services, initiate server failovers automatically, or alert administrators to take action. The focus is on monitoring and managing the end user experience rather than just server and component uptime to help keep the service continuously available. Ignige Website, presents new webcast about Exchange 2013 deployment, and coexistence. From webcast you can learn how to setup an Exchange Server 2013 on-premises deployment with coexistence amongst Exchange 2007 and Exchange 2010. In addition to understanding how Exchange Server 2013 architectural changes enable more flexible network designs, we will discuss tips and best practices for a smooth transition to Exchange Server 2013. Webcast takes about 50 minutes. 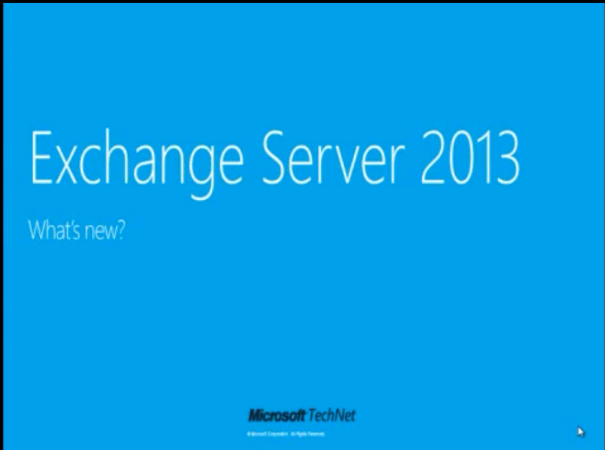 On TechNet websites you can find two new online videos about Microsoft Exchange Server 2013. Both videos are about an hour long. 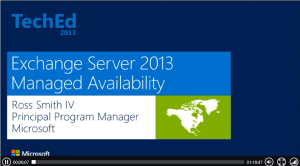 Watching these videos you can get familar with Exchange Server 2013. Fist video: What´s new in Exchange 2013? explains what’s new in Microsoft Exchange 2013 like new architecture, HA, and features.